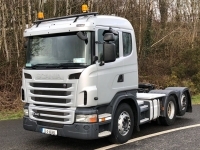 2015 Scania P450 6x2 Highline - ADR FL spec, alloy wheels, Drum Blowing equipment, 2 pedal opticruise, proximity sensors, very clean. 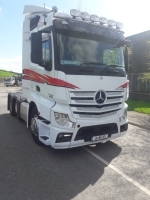 2013 Mercedes Actros 2545, 6x2 with tipping gear. 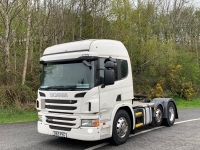 2009 Scania R500 R cab 6x2 with tipping gear and tipping body adaption. 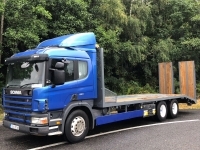 2014 SCANIA ad-blue R440 6x2 Highline. 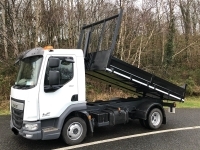 Very tidy truck. 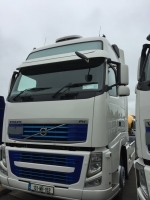 2014 & 2013 Volvo FH 460 4x2's. Version 4 and Version 3. Prestige Trim. iShift. Night Coolers. Xenon headlamps. Max Diesel. 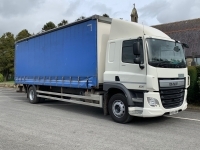 2016 DAF CF 220 4x2 Curtainsider. 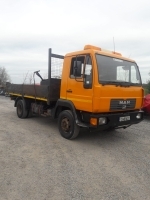 Sleeper cab, 28ft body and cantilever tail lift, Automatic gearbox, air con, only 146,000kms. 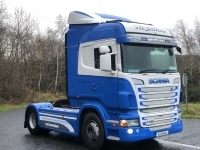 2014 Scania R440 SCR 4x2 Topline. 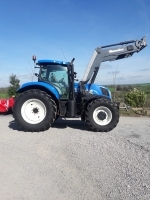 Ad-Blue Engine, Air Con, side skirts, Pod, Max Diesel, only 521,000kms. 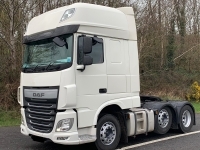 2015 DAF XF 510 6x2 Superspace cab. 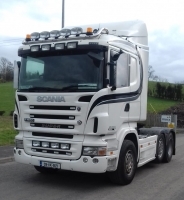 Only 313,000kms, Automatic gearbox. 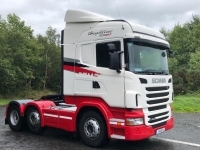 2018 Almost New Scania P250 4x2 sleeper cab, complete with 27ft curtainside body and tail-lift. ONLY 27,000kms. 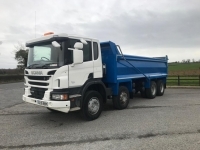 2013 Scania P400 8x4 Tipper, steel body with easy-sheet, auto tail-gate, manual gearbox, tidy truck. 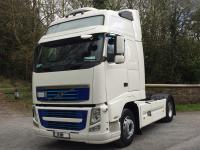 2014 Volvo FH 460 Globetrotter, Prestige trim, xenons, fridge, iShift, night cooler, max diesel, one owner. Choice. 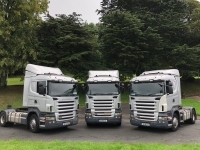 Very nice trucks! 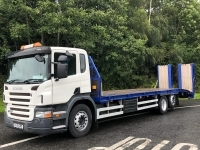 2013 Scania P320 4x2 sleeper cab (draw-bar spec) complete with 24ft GRP box body, manual gearbox, Hitch for draw-bar trailer. 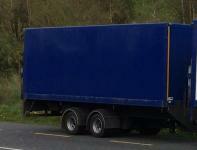 Can be sold as curtainsider either. 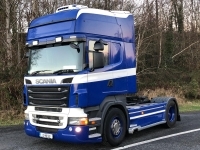 Choice of GRP box drag trailers to suit available also. 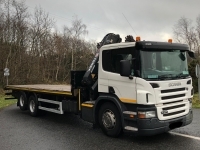 1996 Scania P93 230HP 4x2 beavertail with crane. 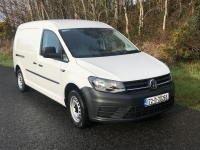 2017 Volkswagen Caddy Maxi. 2L 102 BHP. 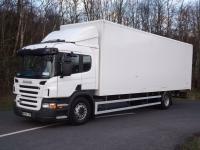 Delivery mileage only. 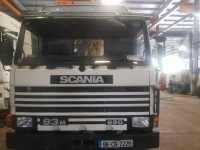 1997 Scania P94 220HP. Manual. 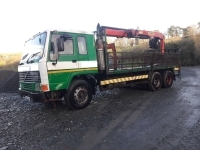 Cab and chassis. 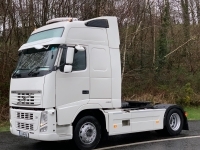 2013 Volvo FH 13 460HP 4x2 Globetrotter XL (version 3) Prestige Pack, iShift, Air Con Pod, Fridge, Velour Seats, Xenon Lights, Side Skirts, Twin Tanks, One Owner, Choice. 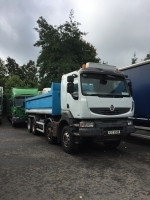 2014 7.5t DAF LF150 4x2 Tipper, drop-side steel body, manual gearbox, tow-hitch, 3 seats. 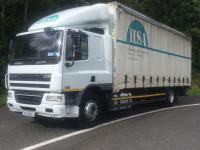 Truck is in immaculate condition throughout. Low mileage. Choice. 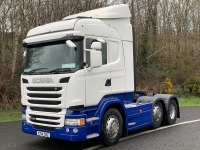 2012 Scania R560 4x2 Topline. 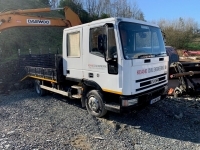 Manual gearbox, retarder, max diesel, air con, air con pod, fridge, one owner truck. 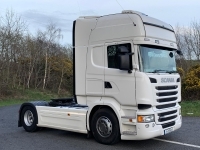 2010 Scania R440 Highline 4x2 manual gearbox air suspension front and rear very clean. 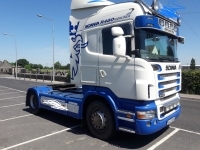 2007 Scania R560 4x2 Topline Opticruise. 2007. 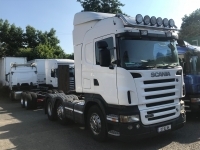 Scania P230 4x2. Long day cab 3 pedal Opticruise. 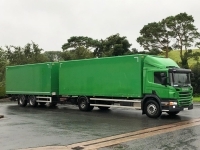 26ft curtainsider body with tail-lift. 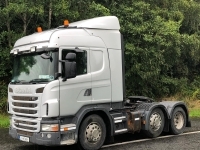 2011 Scania G440 Highline 6x2 twin steer c/w tipping gear. 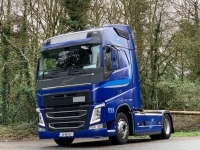 Truck has a 3 pedal opti-cruise gearbox. Choice. 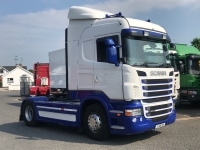 2013 Scania P320 4x2 c/w Box Body and close coupled drag trailer. 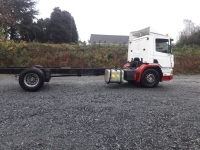 Slider Tail-lifts on truck and trailer with powerpack on trailer. 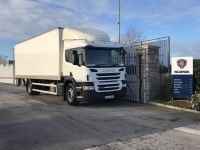 Full McElvaney Motors Service History. 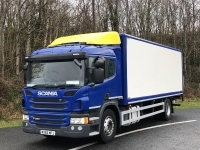 ** Also available with curtainside bodies** Choice. 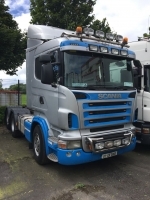 Selection of 2008 Scania R420 4x2. 14 spd Manual Gearbox. 2x 700L tanks. H-chassis (950mm). 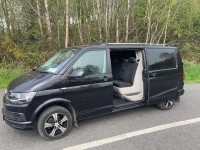 3 leaf parabolic front suspension, rear air suspension. Night Heater. Autolube. Full deflector kit. 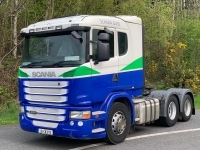 Full Scania service history from new. 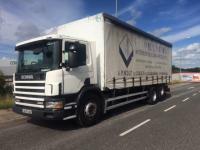 Also 2006 & 2007 similar spec trucks available. 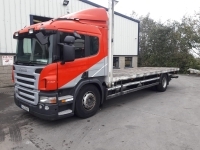 2013 Scania G440 6x2 rear lift tag axle. Manual gearbox. Pumping gear. 300,000kms. One owner. Clean truck. 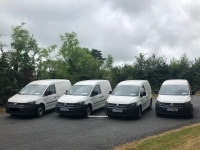 Selection of 2016 New Model 2.0L Volkswagen Caddy 6 Vans. Approx: 100,000kms. Tested Until Jan 2019. 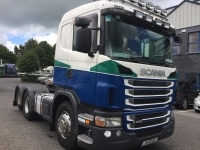 2008 Scania R480, 4x2, Highline. Manual gearbox. Current test. Very clean. 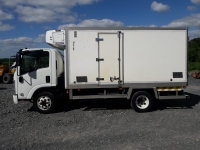 2012 Isuzu NPR Complete with 14ft Fridge body and Carrier fridge motor. 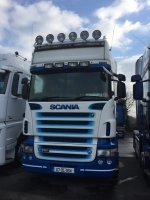 2013 Scania R480. 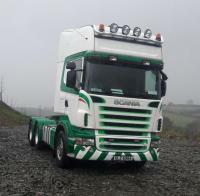 Highline cab 4x2. Manual gearbox. Low kms. Good warranty. 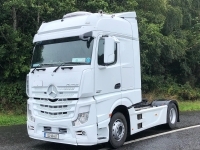 2013 Mercedes Actros 1845. 4x2. Very clean. choice. 2013. 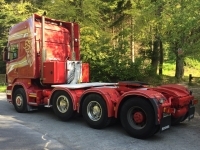 Volvo FH 460 4x2 I shift. Very clean. Choice. 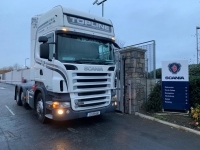 2011 Scania R480 4x2 T/U. 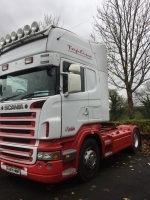 Topline. Opti-Cruise. One Owner from New. Full McElvaney Motors Service History. 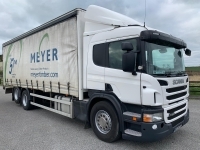 2010 Scania R440 6x2, T/U. Highline. Three Pedal Opticruise. 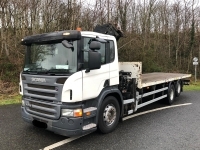 2012 Scania G440 6x2 tag axle. 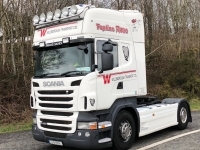 C/w tipping equipment, vertical exhaust, cameras, 14 spd gearbox, sliding 5th wheel, Alloy catwalk, beacons. Ready to go to work. 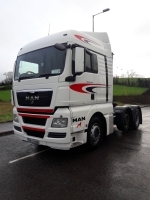 2008 MAN TGX, 440HP, 6x2. T/U. Automatic. Very clean. 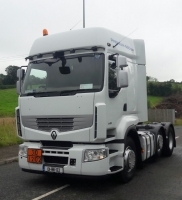 2013 Renault Premium 460HP, 6x2 T/U. ADR Spec. Pumping Gear. 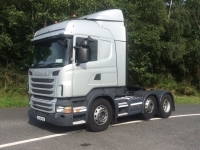 2005 Scania R580 8X4 HEAVY HAULAGE TRACTOR UNIT. 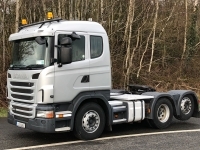 2007 Scania R560, 6x4 hub reduction. 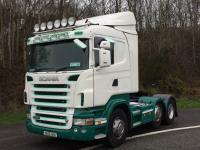 Topline. Manual 150 ton 3.5 pin. Very clean. 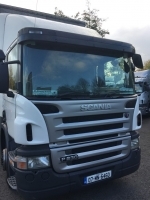 2008 Scania R500 Rcab 6x2/4 Manual Gearbox. Current DOE Test. 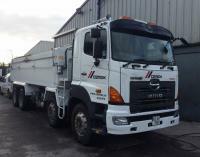 2007 Hino 700 Series, 410HP, 8x4 Tipper. 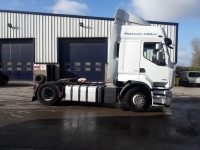 Insulated Steel Body with Roll-Over Cover and Tar Chutes. 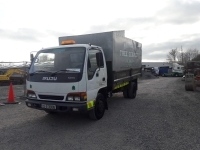 2004 MAN 7.5 ton Fridge. 16ft Body. 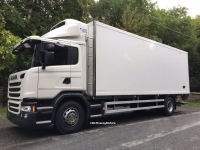 Manual gearbox, Coldchain motor with electric standby, Triple rear doors with folding steps, 4 tier alloy shelving.